DB Land and Planning have the expertise and knowledge to deliver schemes within today’s planning system. The schemes at Wigmore had proved very difficult for Registered Provider’s to deliver and had therefore not been developed. Access to drainage was the main barrier with access required over the adjoining Youth Club’s land. The drainage had not been developed to adoptable standards when developing the Youth Club so agreement had to be sought to replace with new drainage installed to adoptable standards. Budget control was extremely important. The scheme consisted of 14 properties, an existing planning permission was in place for 10 outright sale units and 4 affordable units. DB Land and Planning secured permission for 14 affordable units and sold the land to West Mercia Housing Association. 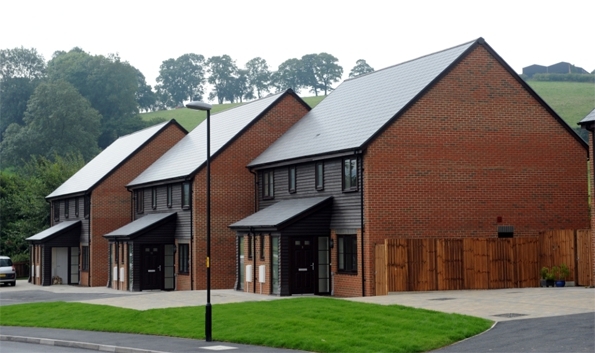 The scheme was the first Code 4 Sustainable Homes scheme in Herefordshire and was opened by the Local MP.